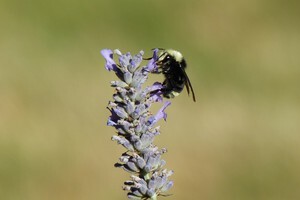 by Ian McCluskey OPB April 1, 2019 4:30 p.m.
Every spring, when the first flowers bloom, mason bees appear. You’ve probably seen a mason bee, but chances are you didn’t know it. Mason bees do not have the classic yellow and black stripes of the honeybee, or the plump fuzziness of the bumblebee. Rather, they are a metallic blue-green — like a house fly. (In fact, they are often mistaken for flies.) 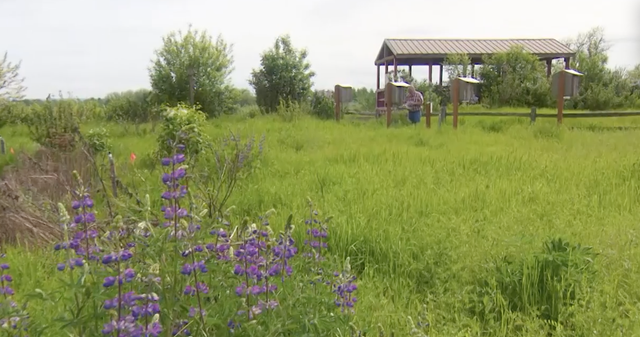 But these little bees are native to Oregon and, because of their incredible pollinating powers, are becoming popular with backyard gardeners and orchardists. They are one of the very first pollinators to emerge in spring. Good news for Oregonians, because this means they pollinate our delicious apples, pears, cherries, blueberries and raspberries. 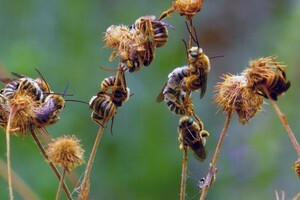 Mason bees are also non-aggressive and almost never sting. Unlike honey bees, they have no hive with a queen and honey to protect. Gardeners have discovered mason bees, realizing that with some basic knowledge, they can become bona fide beekeepers. Ron Spendal was one of those gardeners. When he retired about 15 years ago, he went through the Oregon State University Master Gardener program. During that time, he attended a lecture on mason bees. Inspired, he bought some cardboard tubes and set out to raise some mason bees himself. Spendal is the type that when he does something, he goes deep; as soon as he heard about about mason bees, he studied everything he could. He realized that there actually wasn’t that much published in the scientific literature and what he did find was limited. Of the few studies he found, he noticed some of the information wasn’t lining up with what he was observing where he lived in Washington County, Oregon. He realized those data must have come from other parts of the country with much different climates. So, he set out to find some answers that would help him locally. While most folks set up a single box to raise their mason bees, Spendal didn’t stop there. He went out across Washington county to local commercial orchards, schools and natural areas, like the Jackson Bottom Wetlands Preserve. He built and now monitors around 40 nesting sites and a total of about 550 nesting trays out across the county. Ron Spendal has set up dozens of bee boxes, such as these at Jackson Bottom Wetlands Preserve. Ron Spendal designed and built his own nesting trays so he could study mason bees. A female mason bee collects pollen, then seals up the nest chamber with mud. A male mason bee emerges from his cocoon. Ron Spendal applied his woodworking skills to design nesting trays for mason bees.